As many people are aware, sitting for long periods of time, day in and day out, can be very unhealthy. But, if your business requires your employees to work at a desk all day, what choice do they have? Well, if you’re a business owner in the Dunwoody, Georgia, area, you can turn to NorthPoint Office Furniture to outfit your office with adjustable height desks. 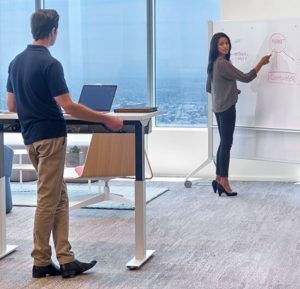 As its name implies, an adjustable height desk is a desk with a work surface that can be raised or lowered, allowing your employees to either sit or stand as they’re working so they can have more energy and avoid the many health risks that are associated with sitting for prolonged periods of time. We have a large 8,000-square-foot showroom that you can visit to see our adjustable height desk options and get a feel for how they will look in your office space. Additionally, when you come into our showroom you will have the opportunity to speak with one of our helpful employees who will be able to answer any questions that you have and help recommend the right adjustable height desk options for your needs and budget. What’s more, we also have space planning services, where one of our experts will come out to your business to take measurements and help you find office furniture that will fit perfectly into your existing office space. For more information on the adjustable height desk options we have available for business owners in Dunwoody, GA, and the surrounding areas, contact NorthPoint Office Furniture today.